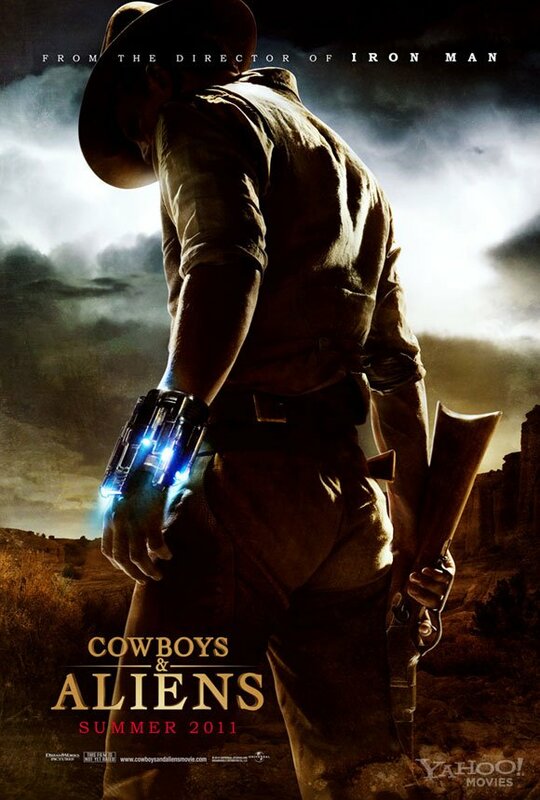 Universal Pictures has officially unveiled the first poster for Jon Favreau’s action-thriller, Cowboys & Aliens, which stars Daniel Craig, Harrison Ford, Olivia Wilde, Sam Rockwell, Adam Beach, Paul Dano, and Noah Ringer in a Western mashup about an alien invasion. Set for release on July 29, 2011, and with the trailer debuting in just under two days from now, the film could very well be one of next year’s big blockbusters. Synopsis: 1873. Arizona Territory. A stranger (Craig) with no memory of his past stumbles into the hard desert town of Absolution. The only hint to his history is a mysterious shackle that encircles one wrist. What he discovers is that the people of Absolution don’t welcome strangers, and nobody makes a move on its streets unless ordered to do so by the iron-fisted Colonel Dolarhyde (Ford). It’s a town that lives in fear. Based on the graphic novel by Scott Mitchell Rosenberg, the script for Cowboys & Aliens was written by Star Trek‘s Alex Kurtzman and Roberto Orci, not to mention Lost‘s Damon Lindelof. Visit www.cowboysandaliensmovie.com for more on the film.